Apart from the fact that they once tried to sign Roy Keane, the link between Bayern Munich and Ireland is non-existent. That’s about to change, though, thanks to the decision last month by the Bundesliga leaders to add a player to their academy. Ryan Johansson, a 16-year-old who has just signed for Carlo Ancelotti’s outfit on a three-year deal, is a poster boy for EU harmony and a bit of Brexiteer’s nightmare: born in Luxembourg to a Swedish father and - crucially from our point of view - an Irish mother, he played club football in France before this move to Germany. He has played underage international football for his native Luxembourg but he’s eligible for Ireland. And interested in the wearing of the green as well, thanks to the influence of his mother, Mullingar woman Christine McCarthy. It could be a case of going from Munich to Mayo as the FAI are hopeful that Johansson will be involved when the Republic’s U16s play in a tournament in Castlebar in May. Ireland scouts were initially alerted to the player’s Irish background by a local journalist in Mullingar, and the Topic gained the scoop on Johansson’s move to Munich. Bayern flagged up the signing on their website last month. “In signing Ryan, we were able to win a highly talented player for us. In the training sessions, he has been able to make a very good impression,” said Timon Pauls, chief scout for Bayern’s youth academy. FAI officials have watched videos of the lad in action and they are in contact with the key figure in this, the player’s mother. “I would hope that he will come in and play for us, he is certainly a prospect,” said an FAI source. Family and work situations in the world of 2017 have changed the nature of football scouting and player recruitment at international level. In previous generations it was easy: an Irish-born couple working in England met, married, had kids, and their sons went on to become decent footballers who would play for Ireland. Players like Kevin Kilbane, Rory Delap and Gary Breen all came from households where both parents were Irish-born, no chase needed and no doubts. Back then, players eligible for Ireland came from places like London, Manchester, Birmingham, Luton. Preston alone provided us with Kilbane and Alan Kelly. But in 2017, Irish people look further afield than the UK for work, and that’s why a batch of young prospects are currently involved with Ireland but were not born or raised here. Ryan Nolan (18) was born in Clare, moved to Spain as a small child when his family relocated for work reasons, played his club football in Spain and from there earned a move to Italy and two weeks ago made his latest appearance for Inter Milan’s U19 side. Recently, foreign-based boys like Marcus Rowley, (who plays for Spanish side Malaga) and Niklas Baylor (on the books with Bundesliga outfit Wolfsburg) were capped at U16 level. Lukas Browning, born in Drogheda but raised in Sweden, is making his way through the ranks at Stockholm side Brommapojkarna, where Olof Mellberg is the overall boss. Over in Belgium, Anderlecht have two players on the books who have been capped by Ireland: current Ireland U21 keeper Liam Bossin (mother from Waterford) and defender Robin Walsh, though Walsh is out with a long-term knee injury while Bossin, frustrated at being fourth-choice keeper at Anderlecht, will go on trial at Nottingham Forest next month. Dutch side Vitesse Arnhem still have high hopes for Caoimhín Fowler (also called Quivi), a lad who was born in Dublin, raised in Australia and now based in Holland. Courted by Australia, his last Ireland cap was for the U17s in 2015. 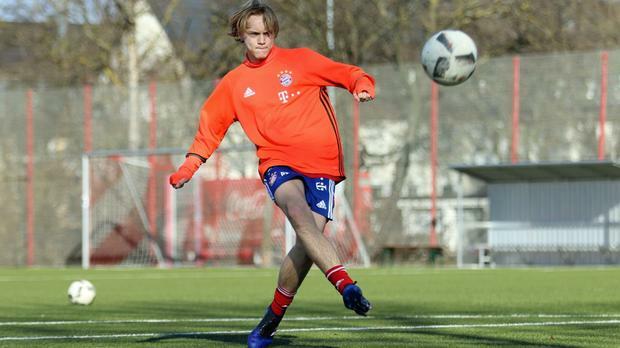 Still only 16 and yet to bed in at Bayern, Johansson could be a sensation or a flop. But at least he will do it in the green jersey.